FA: Vern Clevenger, Eric Schoen, Rob Frick, November 1973. With clean, exposed climbing up the center of Stately Pleasure Dome, Dixie Peach is a step up from South Crack in both difficulty and head games. Fun, featured slab climbing makes up the bulk of the route, but with three slab pitches in a row with no protection at all, a solid lead head is required. The first pitch is the crux, starting up the easy flake start of South Crack and then up a corner to flake to 5.9 slab past a bolt. The next pitch is the psychological crux, with sustained 5.8 friction climbing (with one rest knob) for 40 feet to larger holds and easier climbing. 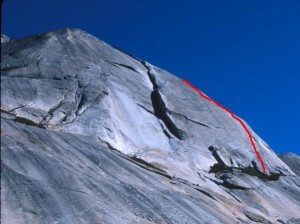 The next two pitches have generally easy climbing up wandering featured slab, and then you can use the finishes of either Great White Book or South Crack. It’s easy to link the 2nd and 3rd pitches with a 60m rope, and you get to clip the intermediate anchor as a piece of pro. Which SuperTopo guidebooks include a topo for Dixie Peach?